Karen and I awoke in our Bright Angel Lodge cabin at 6:45 this morning, packed up, ate a huge breakfast at the B.A. restaurant, and then took the shuttle out to Hermit’s Rest. By the time we got on the trail it was 9:10. The weather turned out just right. 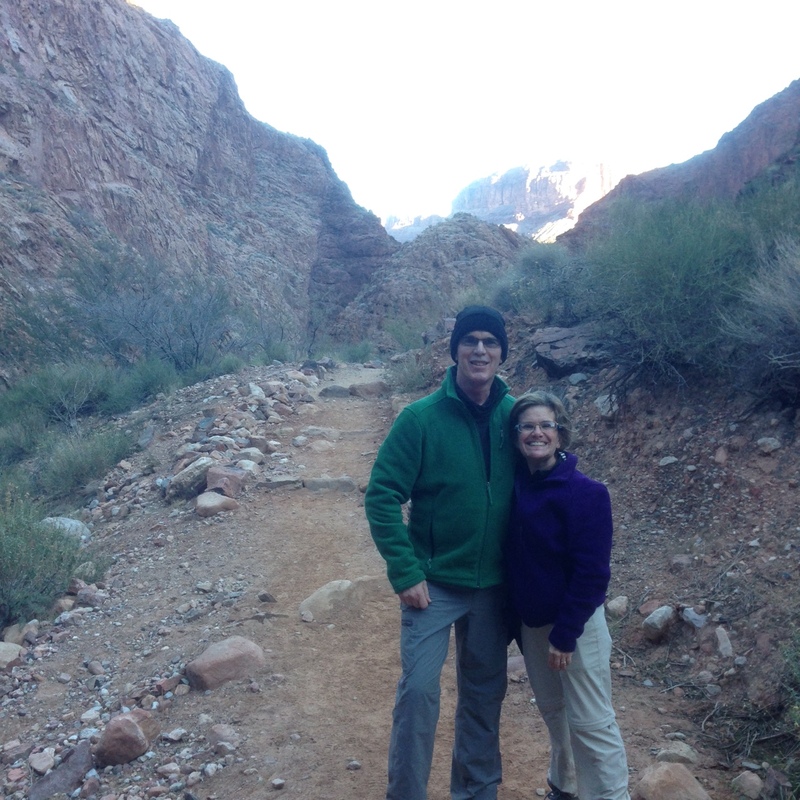 Although Karen and I began our hike wearing down jackets, gloves, and knit hats, we soon grew too warm. Also, there was very little snow on the ground. We were told to leave our crampons with our luggage. The trail was very rocky the entire way. It was just after 11:00 by the time we made it to the Santa Maria Spring resthouse, at 2.3 miles, and had our first break. It took us six hours to get to Hermit Creek Campground, at 8.2 miles. I was unsuccessful at locating the place where I was rescued by helicopter back in December of 1979. 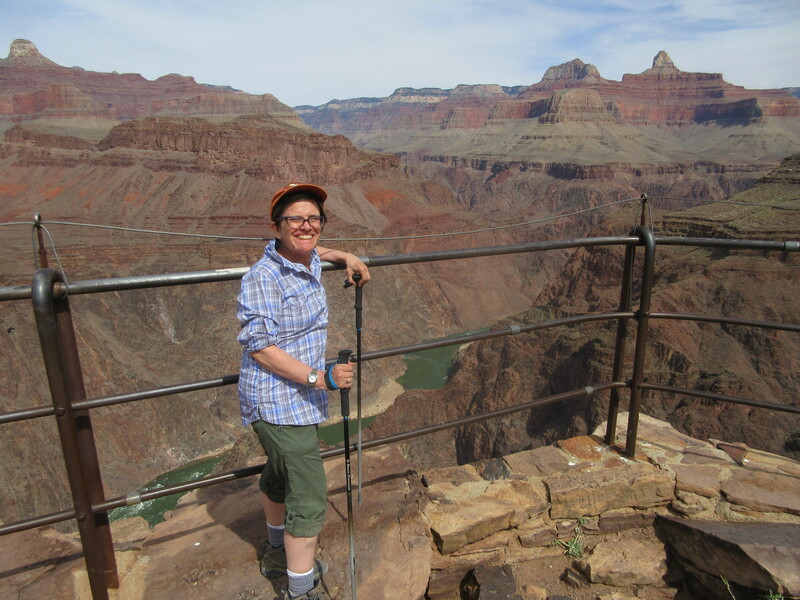 I was working on the south rim at the time and had gone down to Phantom Ranch for Christmas. The following day, my plan was to hike up the B.A. 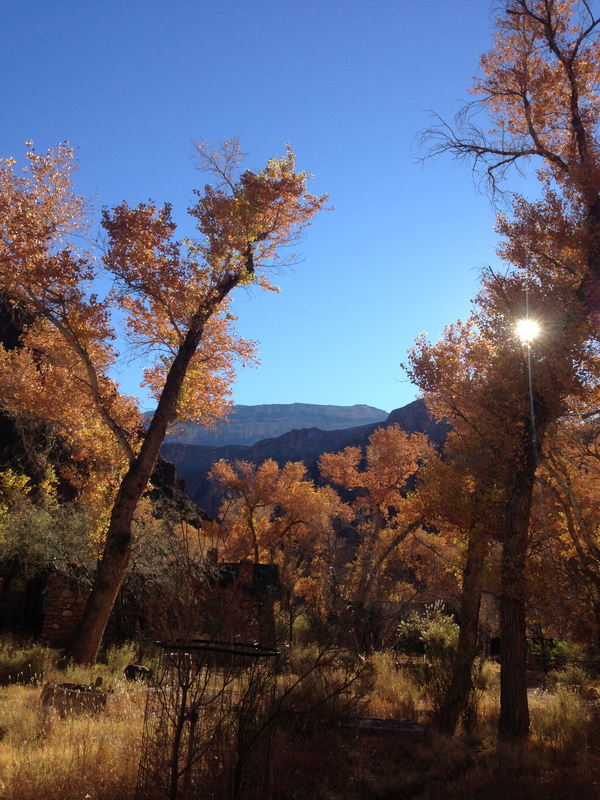 Trail to Indian Garden, hike across the Tonto Trail, and then up the Hermit Trail. 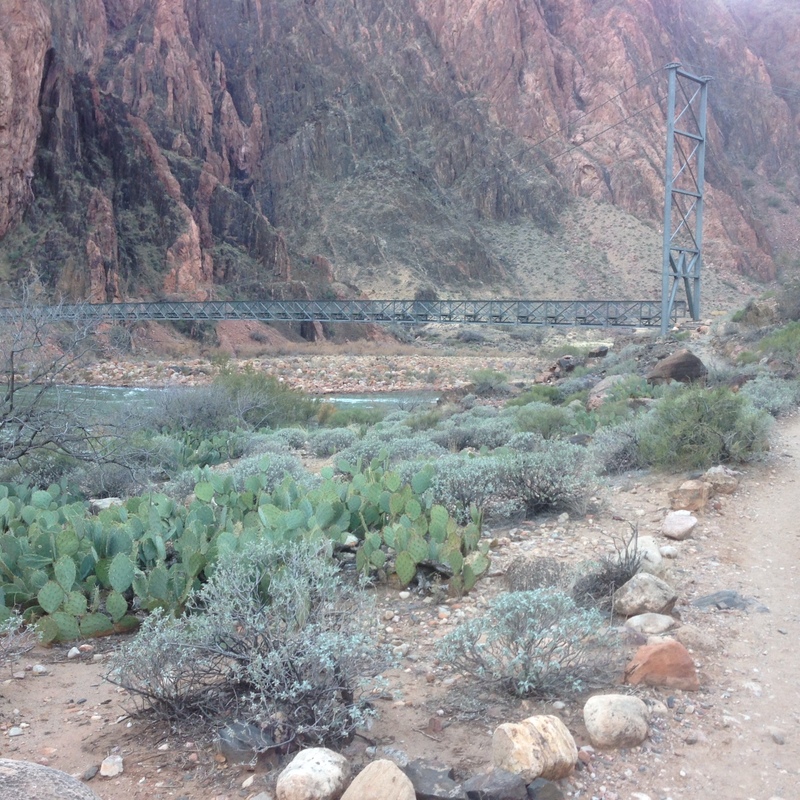 There is now a sign at the junction of the Tonto and Hermit Trails. It would have saved me a lot of grief were it there in ’79. Back then, I missed the turnoff, hiked all the way to Boucher Creek, and ended up spending a very cold night curled up against a rock. The next day, hypothermic, I discovered my mistake and made it partly up the Hermit before being rescued. I doubt I would have survived another night out in the cold. Also new is a very decent privy at the campsite. It is to the Appalachian Trail privies what a house is to a shed. Karen and I have already filtered water from the robust creek that runs close to our tentsite. We just had dinner: chicken with mashed potatoes and stuffing. The sun is quickly going down and the temperature is as quickly dropping. It’s going to be a cold night, but we are well prepared. Last night Tod and I got up to gaze at the millions of stars. It was very cold but we were toasty warm in our long underwear. Today, by design, was a very short hike. Thus, we took our time leaving camp. The panoramic views were fabulous. However, it wasn’t long before we encountered narrow, downward slanting trails that—with a wrong move—would have left us a thousand feet below. Soon, we saw the famous monument, an amazing work of nature. As we drew closer, we could have sworn that we saw a dry creek bed. No water!? I was convinced that we were in big trouble. Tod assured me that we could always walk down to the river, but I wasn’t looking forward to it. Luckily, we were mistaken; the creek was flowi ng just fine. We set up camp by 12:30, leaving us a lazy afternoon to relax and bake in the sun. 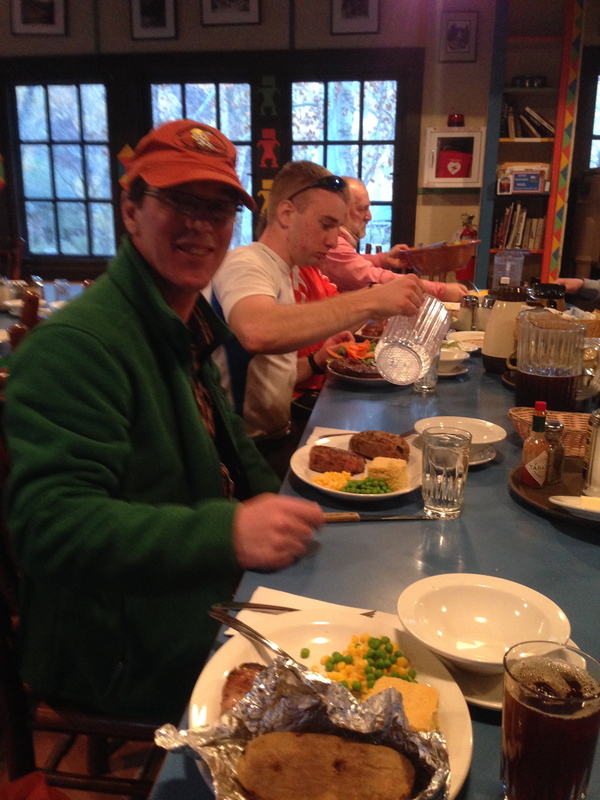 We enjoyed lunch and a delicious dinner before hitting the sleeping bags early to get a good rest for our big hike tomorrow. This morning, after packing, Karen and I loaded up with six liters of extra water, adding a good ten pounds to the weight I’m carrying. Horn Creek has only patches of water, and what it has is radioactive. We left Monument Creek at 8:45 and arrived at Horn Creek five hours later. I was a bit concerned about getting back onto the Tonto, as I had heard that finding the eastward path out of Monument Creek could be very difficult, but Karen and I had no problem following the cairns—although, I should add, the quarter mile ascent out of Monument Creek was not easy. We got to Salt Creek in about three hours. 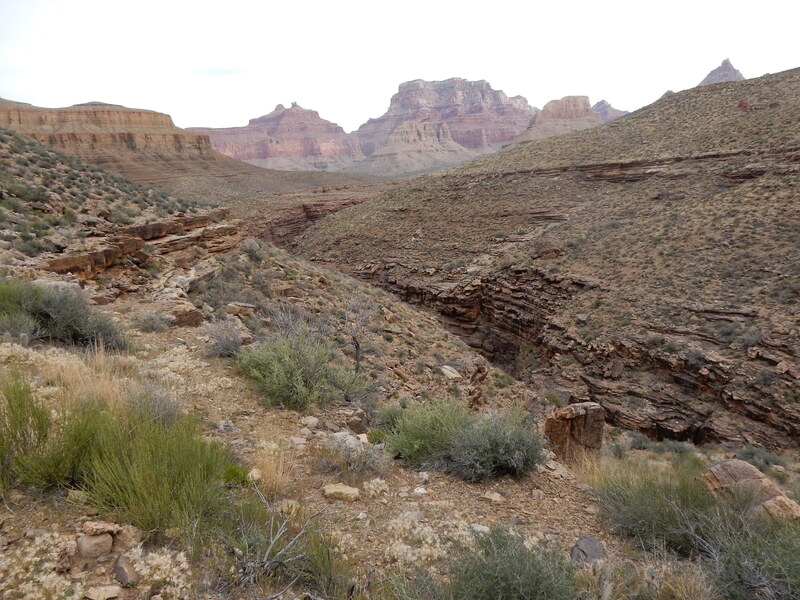 The trail from there to Horn Creek passes by the edge of the plateau and provides excellent views of the Colorado River. During this section of hiking, the weather changed: the wind picked up, and it suddenly got fairly cold. But, despite the clouds and wind, we got no rain. A party of five that we met at Monument Creek said they were heading to Bright Angel Campground. They finally came through Horn Creek at 3:00. Two of their number were, by this time, prepared to desert and attempt to get a site at Indian Garden. We wished them all the best. We are all alone now at Horn Creek. There appears to be two other tent spots here, but—since it is getting late in the day—we expect to have this campground to ourselves tonight. Last night was rather cold, but Tod and I enjoyed hearing several different birds—owls? Our water was still plentiful and Tod brought me coffee in “bed” as a birthday present. 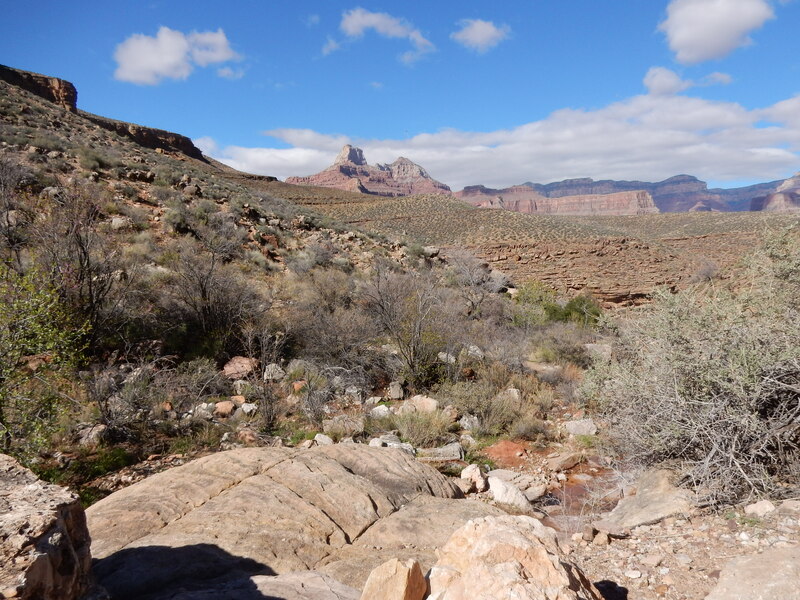 We left Horn Creek by 8:40, and we were happy to experience the solitude and beauty of the plateau for the two miles to the turn off for Plateau Point. The green trees of Indian Garden were certainly inviting. By 10:15 we arrived at our campsite and set up. 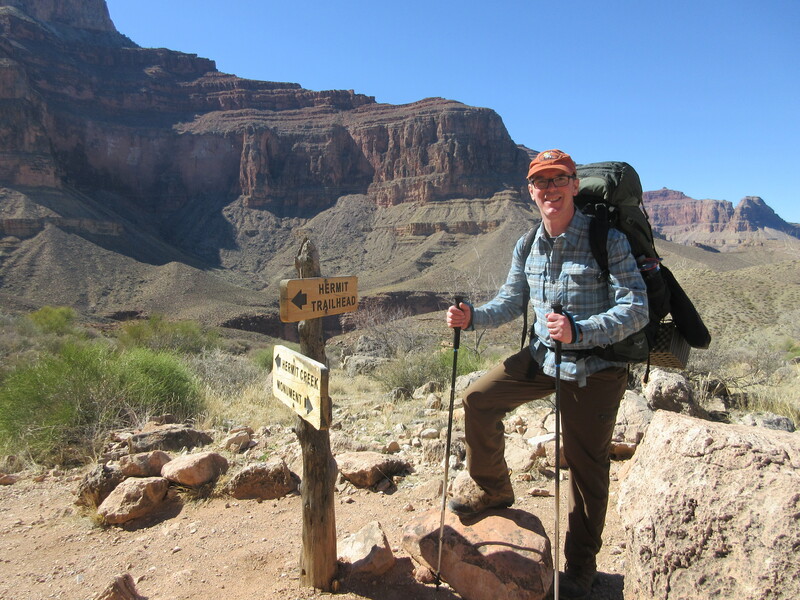 After a hot lunch, we hiked out to Plateau Point, minus our packs. It had warmed up to the 70s and was a beautiful day. The views from the Point were spectacular! As the sun begins to set, I feel a little sad. This is our last night in the Canyon. After coffee and oatmeal this morning, Karen and I packed up and were on the trail by 7:50. We didn’t stop at all until we had arrived at the first resthouse, signifying that we had traveled 1.5 miles. We had good energy throughout the hike and, after stopping again at the second resthouse for a snack, we made it up, out of the canyon, at 10:35. 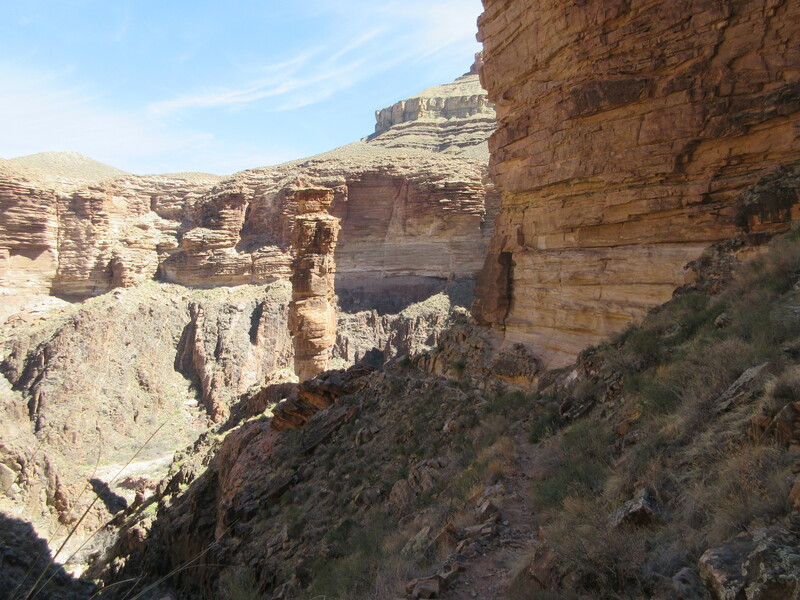 I was getting tired of being asked by folks coming down the trail, “Did you go all the way to the bottom?” — as if a Rim-to-River is the only significant hike in the canyon or the only hike that requires stamina and perseverance. I responded, “No, actually we went down the Hermit Trail and across the Tonto,” and they would always look at me with a blank stare or silently shake their heads as though it all made sense to them. This will probably be the last hike in the canyon for Karen and me until we can get the requisite reservations for a Rim-to-Rim experience. 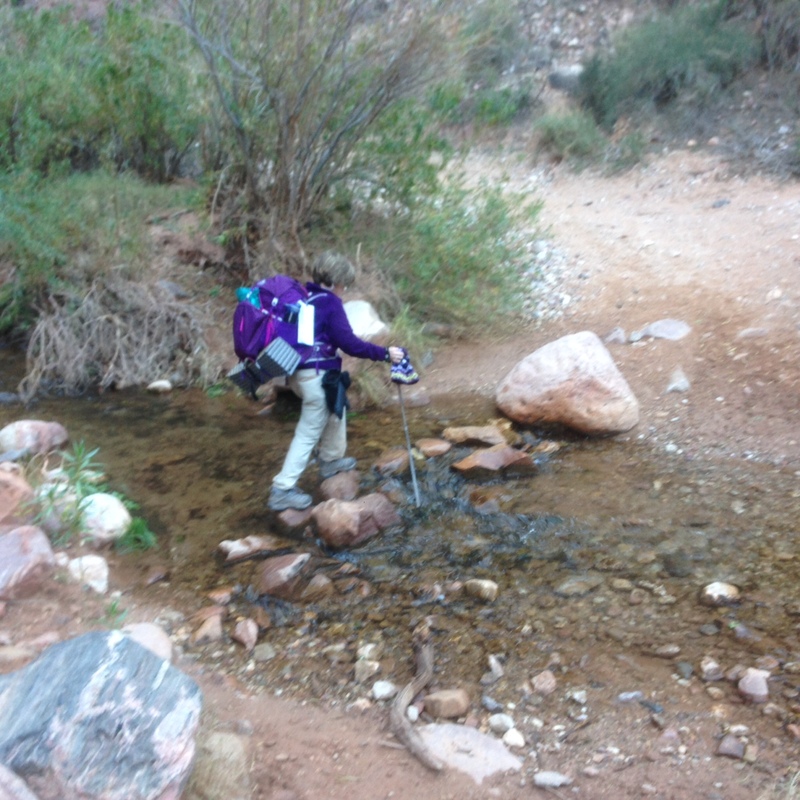 Karen has come to love the Tonto Trail as I do, but she’s not ready for a hike west of the Hermit Trail. This is Karen. Boy, it doesn’t take long to miss the trail! We weren’t even out of Arizona before we were plotting our next visit. To those of you who haven’t visited Grand Canyon, go! Don’t just stay at the Rim, or saunter down the Bright Angel. 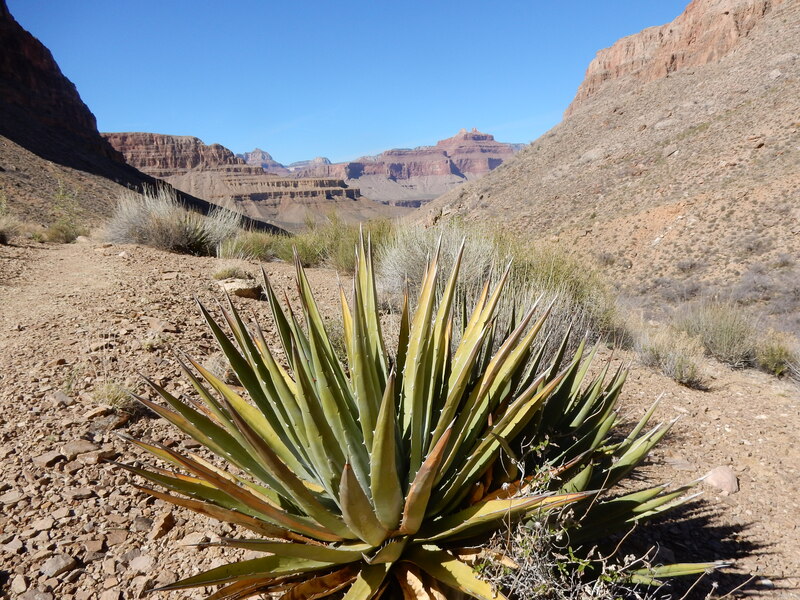 The beauty of the Canyon is best seen in the more remote parts. Spring is an amazing time of year in the Canyon. I can’t wait to go back. March 10, 2016, we awoke to a beautiful day. After a big breakfast we ordered a cab and were soon at the trailhead of the Grandview Trail. 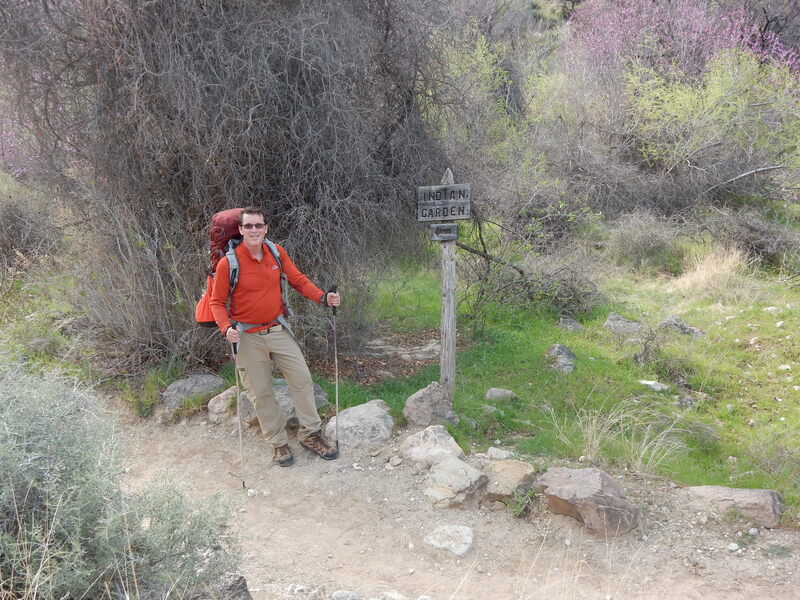 The plan was for a five day, four night backpacking trip that would take us 33 miles across the Tonto Trail to the Bright Angel. Oh boy, what an adventure we’ve gotten ourselves into! There is only one word to describe my feelings during the first part of the trail – fear! Getting used to having a heavy backpack on always takes awhile, but there was no time to adjust. The first part of the trail was quite icy, very narrow, and very steep. Once we had hiked about an hour, we were at the level of red rocks and we began to see cactus. I was taken aback by how hot and sunny it was. We had to stop several times to adjust our backpacks and take in the scenery. What struck me most was how quiet it was….and how green! March is a gorgeous month below the rim. 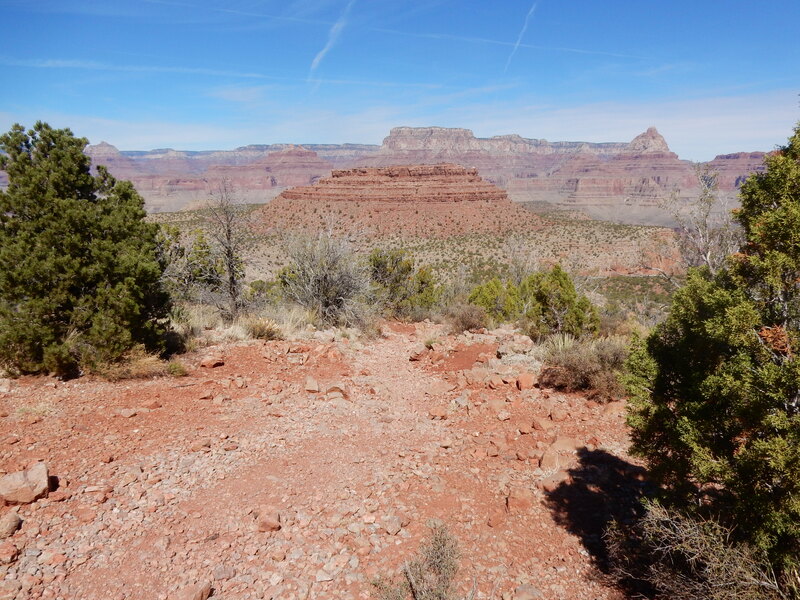 We had lunch at Horseshoe Mesa, which offers spectacular 360 degree views. There we met a nice family that had done the same trip that we were doing, only backwards. We exchanged tips, then started down to what was, in many ways, the hardest part of our hiking experience. The trail down to Cottonwood Creek has short, very steep, switchbacks. The trail (if one can call it that) is very slippery because it is covered with gravel. After getting down to a plateau we took a break between the shade of two trees and had some gorp. One would never guess that it could be this warm in March! Cottonwood Creek campground is beautiful. It has plenty of shade and there are many campsites right on the creek. 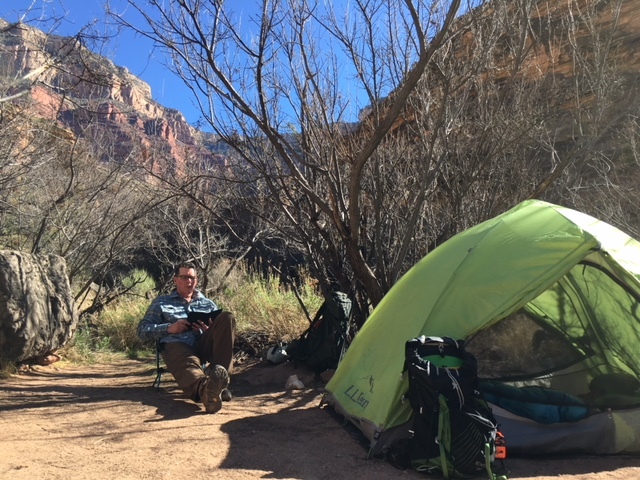 Our tent has great views of the Canyon while also offering us the opportunity to enjoy the gentle sound of the bubbling water. Even the bees, while plentiful, were friendly. A women camping nearby said that the Canyon is severe, but it is nurturing. We can see the truth in this, even if it is only our first day. 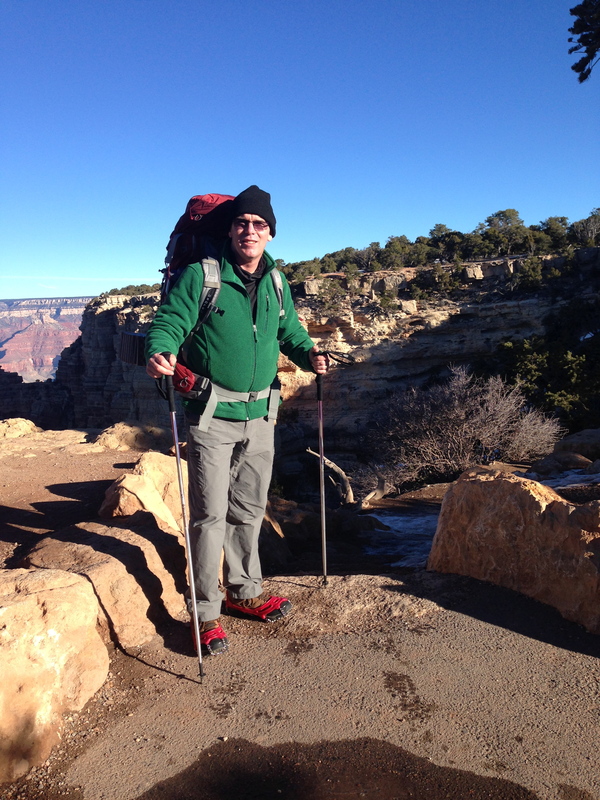 It felt great today to be back on the Tonto Trail after thirty-three years, when I had hiked from the New Hance Trail to the S. Kaibab Trail. 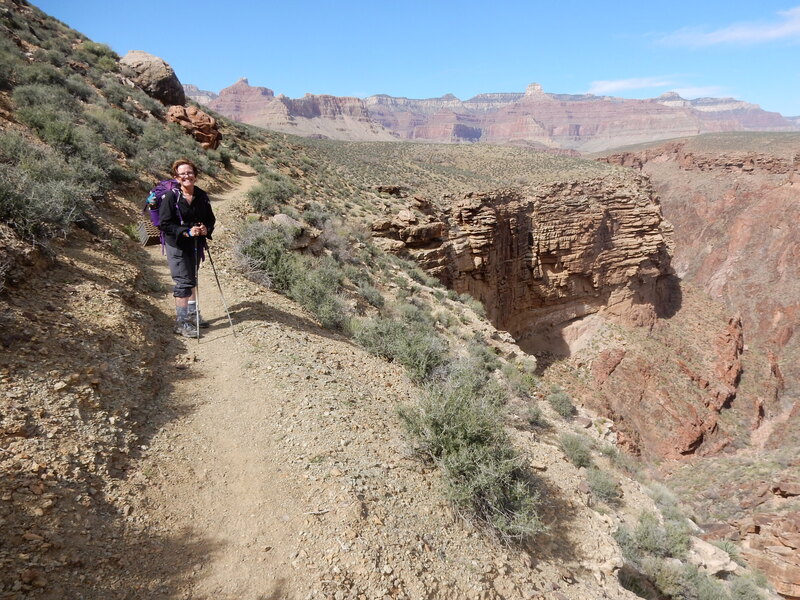 It didn’t take me long to remember why this was my favorite trail in the Grand Canyon—it’s undulating and weaving path through desert landscape and along the rim of the inner gorge. To the north our view was dominated by Woton’s Throne. I was truly glad to be able to share this experience with Karen. Soon, this morning, the Tonto led us out of the Cottonwood gorge and put us on the edge of the plateau, overlooking the river, with breathtaking views all around us and all to ourselves. On the edge of the plateau we found a wash about eight feet wide, with a sandy bottom that made a comfortable spot to sit and rest. So, there we took a half-hour break and made ourselves a cup of coffee, allowing ourselves time to absorb the magnificent creation around us. 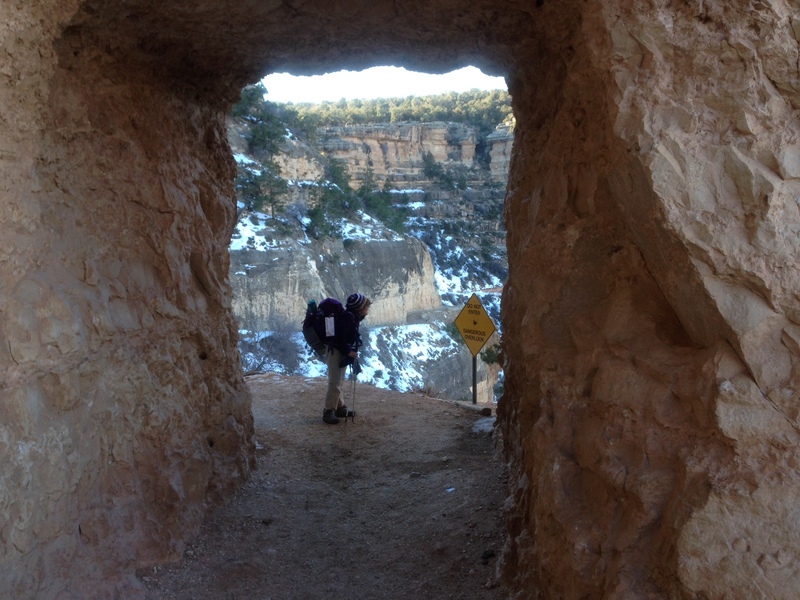 From there, quite soon, we started on our hike up Grapevine canyon, the largest gorge around which the Tonto winds. There are places, particularly on the eastern side, where the trail, on downward slanting terrain, comes perilously close to the edge of the gorge, so that if one were to slip or stumble and fall, one would, quite likely, fall again, and the second fall would be one’s last. Though I felt it important for me to remain in good humor, I must say that I did find the experience here a bit unnerving. At least half of our hike today was going up Grapevine canyon to where we, finally, reached the creek and chose our tent-site. The wind can be ferocious here, so we’ve weighed our tent down with rocks and our backpacks, but still a sudden gust nearly capsized it. We are now resigned to having one person remain inside the tent at all times. The creek here is flowing nicely, as it was at Cottonwood, and it is pleasant to hear it always in the background. Otherwise, it is perfectly quiet here, except for two rather assertive crows. Normally, my blog would start with describing the hike in the morning. Our night in Grapevine Creek was very memorable. At 2 am the wind had calmed down and the stars were bright. By 3 am, however, the wind picked up and the rain began. The wind whipped through the Canyon and we could hear it coming, like a freight train. Then…bam! The tent would go concave and shake as the wind hit it. Boy, was I ever glad that we had worked so hard to put boulders on each corner of the tent. We even added boulders inside the tent! The whole tent shook. Then a calm would come until the next gust. We awoke to a gentle mist followed by a brief period of hail. We made coffee and oatmeal, packed up our stuff, and crossed our fingers that the rain would hold off for the day. It did! This part of the Tonto is just as I envisioned. It has wide expanses, beautiful views and gentle elevations. By the time we got to Boulder Creek the sun began to shine. 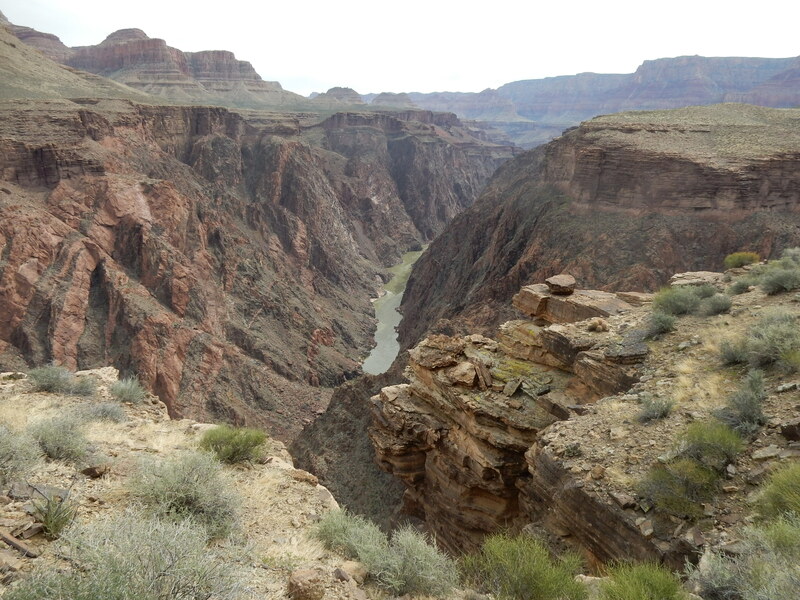 This part of the trail provided us another wonderful opportunity to see the mighty Colorado. We stopped for lunch in a place sheltered by rock, offering shade. We got to Lonetree by 2 pm. This is an amazing, gorgeous, spot. It has beautiful views, shade, water, and no wind. We were totally alone. Who could ask for more? We had Lonetree completely to ourselves last night, and so we had our pick of three or four unshaded tent-sites. The sky was cloudless, and the midnight stars were spectacular. Coming out of Lonetree this morning, we neared the edge of the plateau and were, once again, treated with fantastic views of the river. For the greater part of the day, Zoroaster Temple and, behind it and to the right, Brahma Temple, dominated our view to the north. We made good time reaching Cremation Canyon, but between Cremation and the eastern edge of the national park corridor, we were slowed down considerably by difficult terrain and, once, by being misled by cairns, so that we spent forty minutes in recovering the trail. Ultimately, I had to leave Karen, and do a reconnaissance. Knowing that, at some point, the trail would either have to go down into or around the next gorge, helped me to locate it and, then, trace it back to where we had lost it. 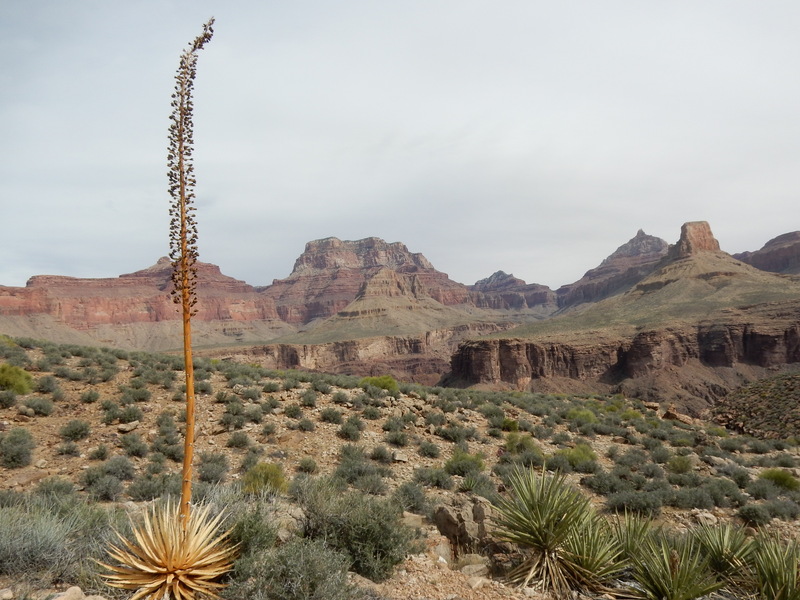 Once we reached the junction of the Tonto with the S. Kaibab, our solitary venture was, practically, over. We were still the only ones we could see on the Tonto, but we knew that we were never again far from other people. Fortunately, for cooking lunch at this junction, we had brought a couple of extra liters of water with us in our dromedary, for the sun beat down upon us all day long, until 3 p.m., when we reached the shade of Indian Garden. Pipe Creek, I should mention, was an oasis, where we cooled our faces with running water. Karen actually dipped her entire head into one of its pools. 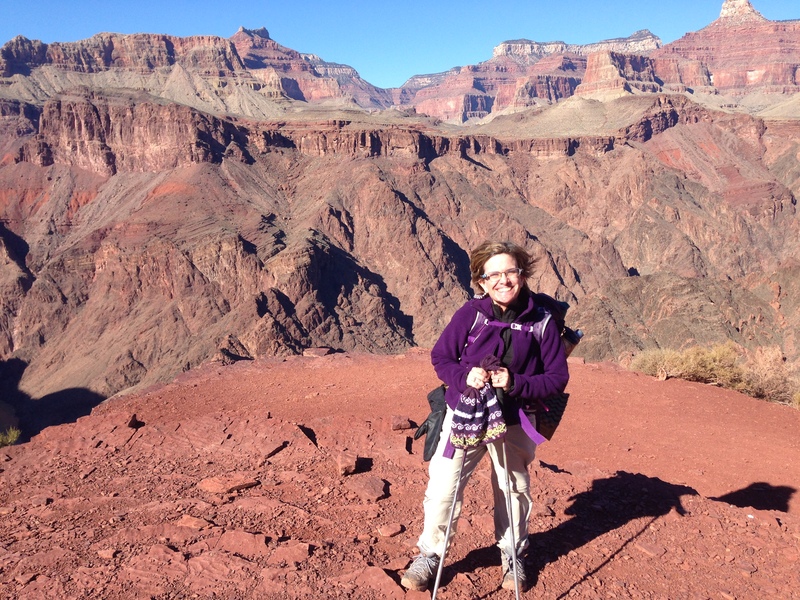 It was surprising to us how hot the Grand Canyon can be in March. Here, at Indian Garden, we have one of many campsites—all shaded, with filtered water nearby. 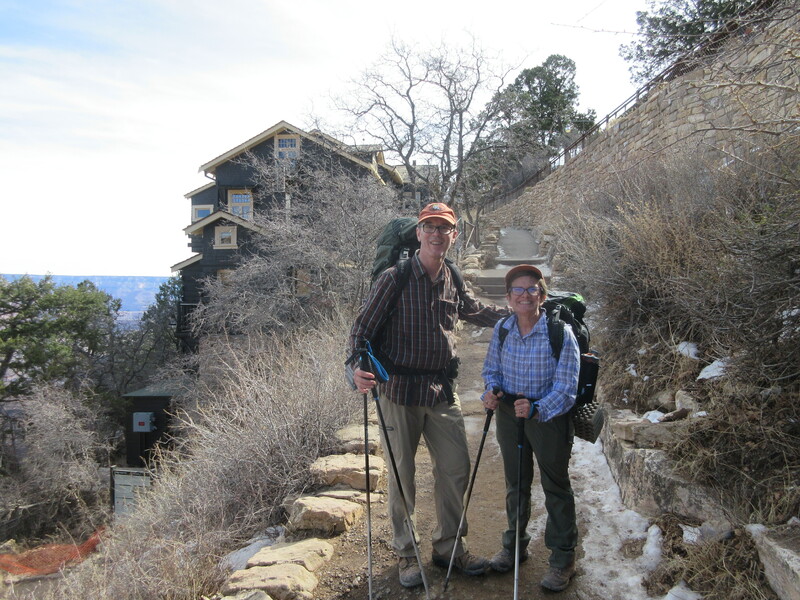 Our neighbors are on spring break, a couple of which are enjoying backpacking for their first time and have expressed how addictive they have found it to be. Welcome to the club! Backcountry hiking is, indeed, the only way to truly experience a national park. We awoke in Indian Gardens pretty early, along with many others. It is quite a culture shock to see so many people. Even the fact that we had a privy and running water seemed out of place. What a luxury! We spoke briefly to a park ranger last night and I was sort of glad to hear that getting lost in Cremation Creek isn’t very unusual. I’m so thankful that park rangers are at our disposal. As we ascended the Canyon, both of us felt pretty good. It wasn’t long before we made it to the first rest stop at “Mile 3”. Coming down in the opposite direction was a wide range of folks, including families, college students on spring break, and international tourists. We even saw some college students making their way down the trail at 8 am drinking beer and carrying a 12 pack. (It would have been interesting to see how they did on the way out!) Again and again we saw people unprepared for the rigors of the trail. With each mile we slowed down a bit, but it wasn’t necessarily a bad thing. I couldn’t help but feel sad leaving the Canyon behind. Life in the Canyon is a sharp contrast to the Facebook-focused, text-driven life on the rim. We made it to the rim by 11 am. A small group passed us when I saw that we were close to the top. By the time we got there, they were right behind us. “You made it 33 miles and we lasted 33 seconds!” they said. We felt like real heroes when they took our picture for their vacation scrapbook. No words can really describe the thrill of the experience. What a fantastic adventure! 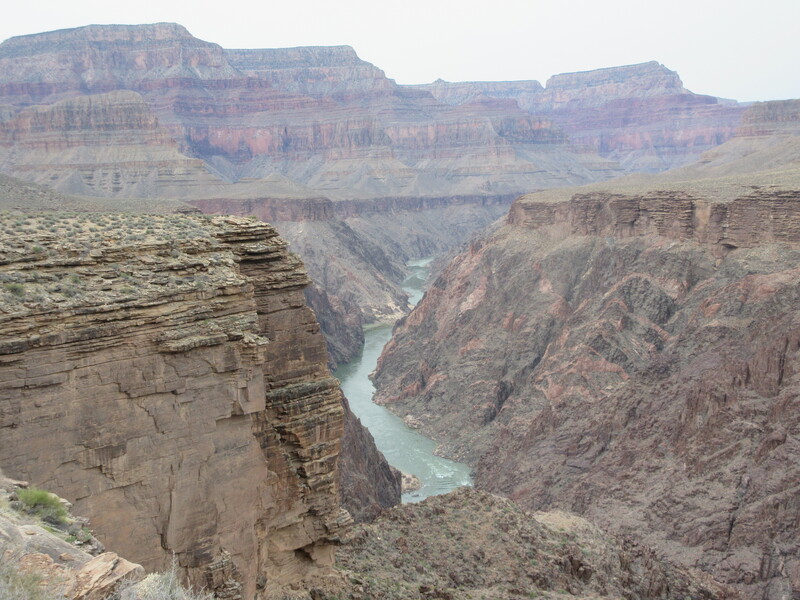 Last April Tod and I visited the Grand Canyon. We were 50+ years old and out of shape. It never occurred to us that it would be possible to hike to the bottom. All that changed as we began hiking in summer 2014. Maybe we could make it? Maybe? The test finally came in January. 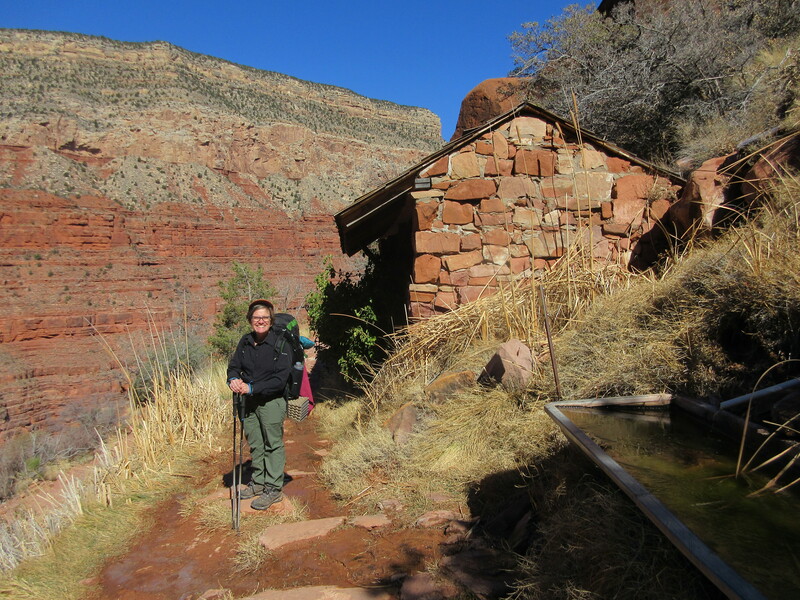 By a stroke of luck, we were able to get reservations to Phantom Ranch for January 7. That morning, as we waited for the hiker bus to the South Kaibab trailhead, we met a father/son who were also doing the hike. We were surprised by how few people were making the journey with us. The beginning of the trail was icy and packed with snow. We were prepared, wearing mirco spikes, but we didn’t need them for long. I loved the feeling of being IN the canyon! As we continued down, we enjoyed the view at Ooh Aw Point and stopped briefly at Skeleton Point. Boy, was it windy! Along some of the ridges, I was sure that I would be blown off the trail. It was amazing, at times, to look down and see beyond us the switchbacks of the trail, realizing that we were destined to take the same course. We had a quick lunch at the “Tipoff”. Here, we saw a few other hikers who were also taking a break. Overall, we saw very few people on the trail. While January may be a bit cool, it was perfect weather for hiking. The remainder of the trail was steep. We had the big incentive of seeing the Colorado River. I couldn’t wait to get to the bridge! By now, my legs felt a bit like spaghetti. I was ready for Phantom Ranch. Going over the bridge, we had an incredible view of the river. 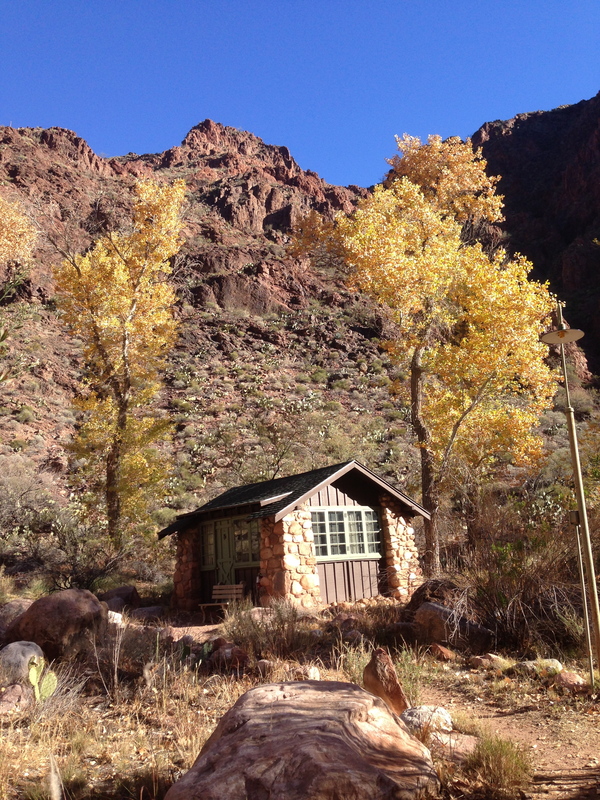 Phantom Ranch seemed like heaven. A little oasis. It was relatively warm and there were beautiful trees and vegetation. As you might imagine, the sight of the canteen was pretty sweet too. We enjoyed a big glass of lemonade and relaxed with other hikers. The steak dinner was delicious and our cabin was amazing. Was it worth it? Totally! 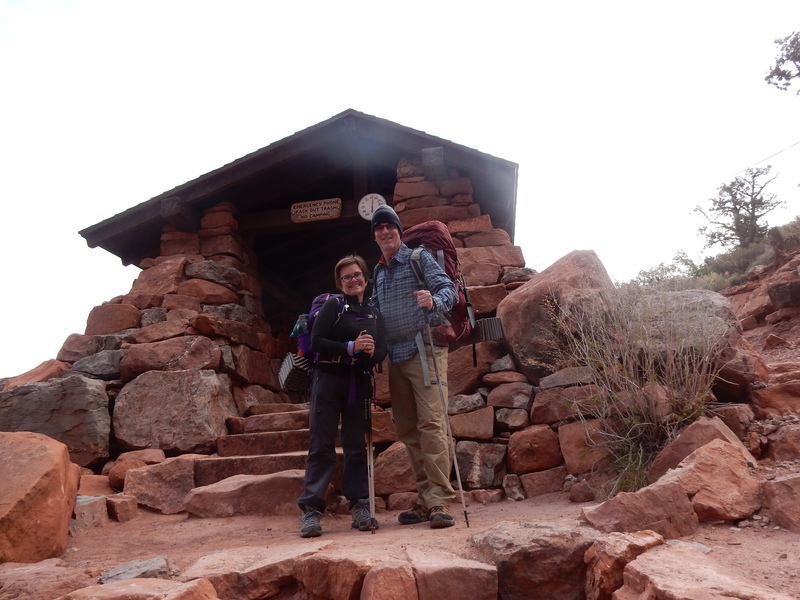 On the morning of January 8, Karen and I awoke by the alarm set in our cabin at Phantom Ranch. We had opted for the late breakfast, scheduled for 7:00–scrambled eggs, bacon, pancakes, peach halves, with orange juice and coffee. Checkout was at 7:30, so after breakfast we hurried back to our cabin to retrieve our backpacks and set out on the trail. 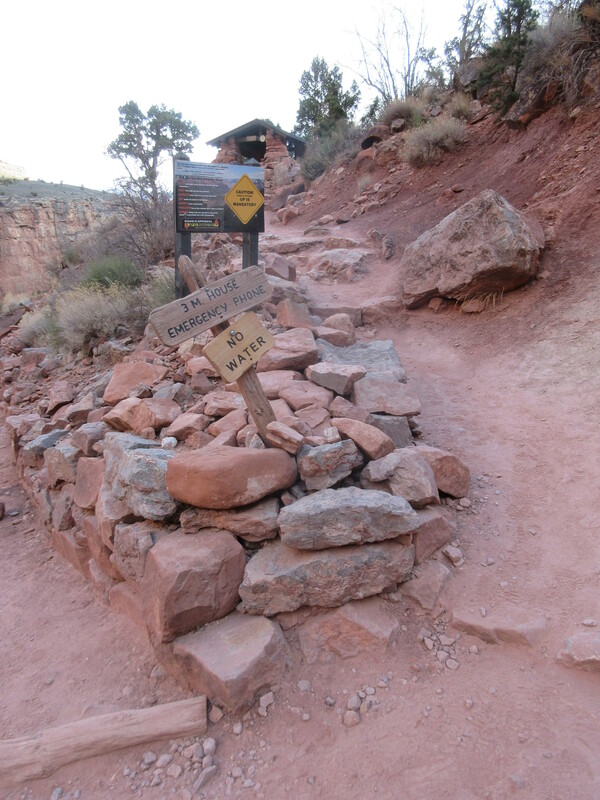 As you leave Phantom Ranch, you find no sign pointing the way to the Bright Angel Trail. 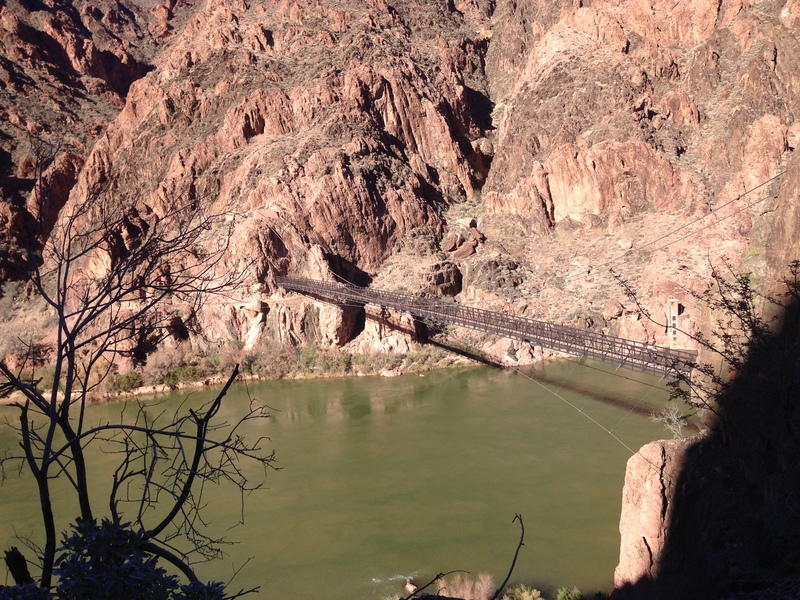 You must simply cross the bridge over Bright Angel Creek into the campground, and as soon as you do so, you’ll find yourself on the Bright Angel Trail, heading toward the silver bridge that crosses the Colorado River. On the other side of the river, you walk eastward along the river trail, which is very sandy in places. Ultimately, the trail leaves the river behind and enters a gorge. Here you follow Garden Creek, crossing it half a dozen times. “The devil’s corkscrew” is a series of switchbacks by which you gain considerable elevation on your way out of the gorge onto the Tonto Plateau. Along Garden Creek, Karen and I met up with our two friends who were also on their way out of the canyon, Joe and Jack H. We were glad to have their company for a short while, but we insisted that they keep to their own faster pace. While walking along Garden Creek, one appreciates the fauna and the places where the rocks create little waterfalls. 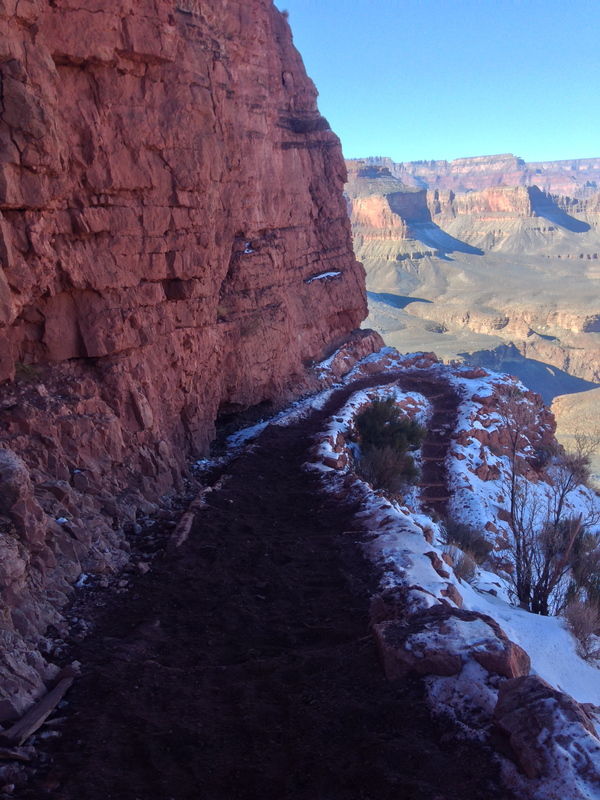 Here the Bright Angel Trail has its own beauty, though without the panoramic vistas of the S. Kaibab. By about 11:00 we had reached Indian Gardens, and Karen and I had our lunch break. The sack lunch that we purchased from Phantom Ranch included a sliced bagel, cream cheese, strawberry jam, peanuts, pretzels, Craisins, Oreos, a beef summer sausage, and Vitalyte, an electrolyte replacement drink mix. The next mile and a half brought us to the three-mile rest stop. This seemed the longest mile and a half we had yet walked, and the increase in elevation had left us feeling exhausted. We took a break for about five to ten minutes and continued on. Yet, from here to the end of the hike I slipped into survival mode and took very few additional photos. All of my energy had to be reserved for the sole purpose of hiking. Karen and I took our time hiking those last three miles up through the constant switchbacks. There were times when I could not take more than ten steps without pausing for a minute. Karen too was exhausted. Finally, the Kolb Studio came into view, and we knew that we had made it to the top, having hiked the Bright Angel Trail in eight hours.